New England is home to a number of different architectural styles which inspire restorations of old homes as well as form the basis for new projects. Those in love with traditional detailing have an array of design options with which to compose the exterior look of a house; and at the end of a thoughtful process, a passerby will recognize that the house feels right at home in its landscape. Enter the house and you have the home. Comfort, practical considerations, and personal taste are the rules which take precedence over tradition, and it was to this end that our customers wanted us to design and build some cabinetry to remind them of their Danish roots. While not wanting to copy any one architect or designer in particular, the emphasis would be on using the richness of natural wood, a minimum amount of surface detail and ornament, and an installation to produce a free-standing look as opposed to a built-in one. The choice of black walnut as the primary wood set the tone for the cabinetry as furniture, rather than an extension of the house's painted interior trim. Here the cabinetry pieces came together as freestanding clusters raised 6" off the floor on legs and presenting themselves as a table or desk might. This approach had the added advantage of allowing a full view of the wide, white pine floor boards, running to the room's perimeter. Cooking surfaces were lowered to 32" above the floor for a comfortable work height and capped with a concrete counter for resistance to heat. Wet surfaces surrounding the sink needed to stay at 36" high to accommodate the dishwasher. To best contain the water at these areas, a custom welded sink, drainboard, and backsplash was formed, with a "marine edge" (sloped) at the front to shed water back into the sink and drain area. (You would not believe the number of renovations that are set in motion by water getting its own way). The message center and computer station was lowered again, to 30", and finished with a wood writing surface that welcomed the touch. The merits of using veneer vs. solid woods were discussed at length. Veneers would help keep the price down, produce uniformity of grain and color throughout the project, and allow for large surfaces to be stable and flat. Solid woods on the other hand would produce a stronger looking grain that would vary from board to board: they would also be necessary at certain structural parts of the job. The decision was made to use veneer only at the very large doors and sides of the cabinets, for stability and ease of construction, and to use solid wood for the smaller doors, drawerfronts and the legs and supporting horizontal members of the cabinets. To keep the surface of the cabinet doors simple, a "milled" pull was used instead of decorative knobs or handles. Crescent shapes were cut into the edges of doors and drawerfronts allowing the hand a place to grab. 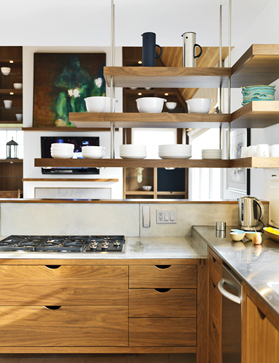 Additional elements that draw the eye in are the stainless rods which support the free end of cantilevered shelves, and Industrex glass panels which float in front of walnut doors on custom metal stand-offs. 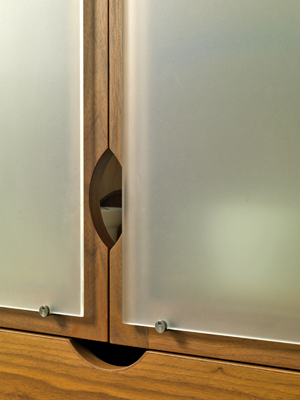 The semi-transparency of the glass allows the contents of the cabinet to be partially hidden from view, while providing a background of shape and color.